I promise not to hurt your wallets this week! I mean, unless everyone who reads this column buys this on the bay, and the price then shoots thru the roof! Anyways, this week we are looking at an issue of Wizard Magazine! It is #99, from November 1999, with the amazing Alex Ross doing the cover artwork. 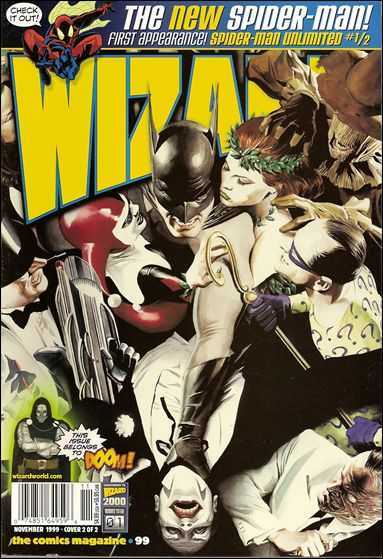 And look who happens to be on the cover, the Batman Rogues, featuring Batman himself, the Joker and Harley Quinn! An Alex Ross cover with Harley Quinn! And also looks like a couple of the Batman ’66 stars, such as the Riddler and Penguin. As I stated earlier, these will not break your bank. There are a few on the internet as we speak. Not sure if they will be there long, but who knows! But when you have a legendary artist like this, with characters like that, you need it! In terms of print runs, if anyone has a clue, let me know. I do know in it’s hey-day Wizard was pumping out about 100,000 per month. BUT as times got tough, their print run was around 3-4,000. Now if you can find a bagged version, that’s a whole other story….Go get them!